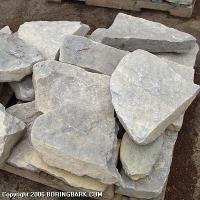 Patio stone in triangular shapes. Thicker and heavier than the thin split, commonly 4 inches thick. Used in water features, ponds, pathways, wall building and more.